When three alien species detect the complete dissolution and waste of a planet in a neighboring solar system, they send out their top specialists to control the out of hand situation that is running rampant over this foreign land. A group of highly skilled teenagers stands at the forefront of the mission, ready to put down these animals and save what they can of this planet. But after diving into the intricacies of what makes this planet’s inhabitants so unworthy to possess their home, will the damage to this place and its inhabitants be too much to save? Or is there hope for this hell world? 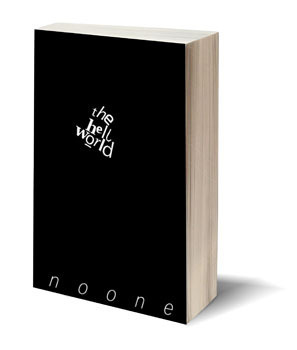 “Where are all of their superheroes and gods now?” opens chapter 15 of n o o n e’s Hell World. A story of a group of alien teenagers’ invasion of a planet so vastly different from their own challenges the idea of what it means to be merciful to creatures who are viewed as less intelligent. 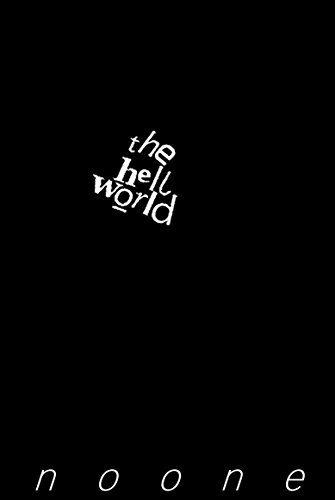 From the beginning of the story, the author starts to create a visual of this “hell world” through lengthy description. What the author lacks in brevity of description is made up in original, outside the box, analogies to describe the “animals” which control the world. Because of the excessive description, it appears at first that the entire story will be nothing but a manual of what the hell world includes, who the inhabitants are, and how they could theoretically be destroyed. Thankfully, the book takes a turn for the better by introducing characters that break up the large blocks of text with dialogue. Descriptive phrases in the book will not be lost on earth’s inhabitants as the author strays from creating their own words or dialect for the original alien characters. Quite often, the description in the book is a bit unnecessary. Two paragraphs discussing a female character’s need to urinate seems out of place and hinders the story from flowing as organically as it could. Passages like that are littered throughout the story. There are definitely some moments of light when it comes to the description. When the aliens are up close and personal with the inhabitants of the hell world, the manner in which the author describes the “animals” is well done and presents visually alarming images for the reader as the description of the removal of an infant leaves an imprint on the readers mind. The author’s creativity comes into play by creating and establishing three different species of aliens. However, the description of these alien species and their differences are lost in the large chunks of text that make the book feel more like a stream of consciousness reading instead of a structured story. The overall message of this book is not lost by any means. In fact, the purpose of this story is blatantly written on almost every page without apology. The author wants to show the dangers of how the inhabitants of this “hell world” are mistreating the planet that they’ve inherited. From treatment of their own species based on gender or skin color to the murdering of “lesser” animals, the author condemns most practices that the inhabitants take part in. The promise of hope offered to the reader and the animals of the hell world is one that will not easily be forgotten.